After the creation of the autocephalous Orthodox Church of Ukraine (OCU) and Constantinople’s abolition of the jurisdiction of the Russian Orthodox Church over the Ukrainian episcopate, the Ukrainian Greco-Catholic Church (UGCC) became the second largest and most influential Christian denomination in Ukraine. According to various estimates, the UGCC comprises about 6 million faithful. The Ukrainian Greco-Catholic Church is in communion with Rome, but retains the Byzantine liturgical tradition. This creates a unique opportunity for it to conduct ecumenical dialogue between Catholics and Orthodox who actively seek ways to overcome the schism that arose in 1054 and was partially overcome in 1965 after the lifting of mutual anathemas. The ultimate goal of this dialogue is the complete Eucharistic unity in the one Church of Christ. That is, the opposite of what the Russian Orthodox Church (ROC) did, when on October 15, 2018, it broke Eucharistic communion with the Mother Church—the Ecumenical Patriarchate. The Head and Father of the UGCC, His Beatitude Sviatoslav (Shevchuk), Major Archbishop of Kyiv-Halych and Metropolitan of Kyiv, and the head of the OCU, His Beatitude Epiphanius (Dumenko), Metropolitan of Kyiv and All Ukraine, are united by the fact that they were both elected to lead their respective churches at a fairly young age. Both stand by the position of the state, sharply condemn Russian aggression, and are open to broad Orthodox-Catholic dialogue. This unity of attitudes and views creates optimistic prospects for the unification of Ukrainian Christians. His Beatitude Sviatoslav even believes that in the future a patriarchate of the united Kyivan Church may appear in Ukraine. 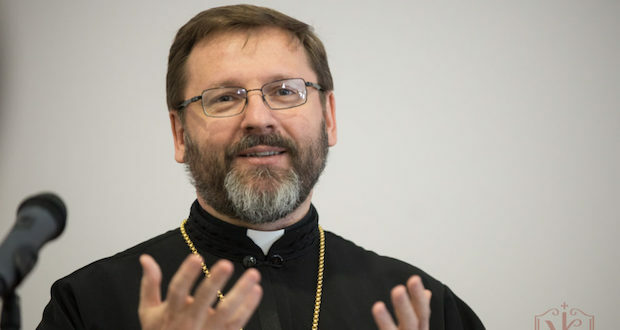 At the same time, in an exclusive interview for “Glavcom,” the head of the UGCC, Sviatoslav, warned the newly created autocephalous Orthodox Church of Ukraine of the risks of becoming an instrument of political battles and the temptation to identify with the state apparatus. After all, political interference, as evidenced by historical experience, most often leads only to divisions and conflicts in the religious context. Your Beatitude, what are your forecasts for 2019, given the two important political events—the presidential and parliamentary elections—that could lead to dramatic changes in the country’s life? I think that today, in the present realities, it is very dangerous to try to predict something. However, we can already see that there will be some challenges. These elections will not only be a test of the maturity of our politicians and candidates, but also a demanding test of the democratic maturity of the voters themselves. Because the quality of the choices made by our society also depends on the quality of our elected politicians. Today, the church is de facto the only institution that needs to defend genuine democracy in a clean and impartial way. Ukraine as a democratic state is only now coming to be, it is only now going through the process of its formation. In fact, only after 2014 did the process of forming genuine Ukrainian sovereignty begin. And this is all the merit of our civil society. Another challenge facing Ukraine is a test of the maturity of our church life. Today interesting historical processes in Ukrainian Orthodoxy are taking place, ones that actually represent the religious majority in Ukraine. How capable Orthodox hierarchs will be of taking responsibility for the fate of not only their church, but also of the Ukrainian people—the future will depend on that as well. In addition, many fear today that the Orthodox Church can become an instrument in political battles. What needs to be done so that it does not turn into such an instrument? The church must remain Church. And state institutions and politicians must allow it to do so. That is, politicians need to rid themselves of the temptation of instrumentalizing the church for their own interests. You have observed the process by which the Orthodox Church of Ukraine obtained autocephaly. To what extent was this process politicized or was the assistance of the authorities within permissible limits? After all, one hears criticism that reception of the Tomos was an electoral campaign project of Petro Poroshenko. Would the OCU have been able to attain autocephaly without the help of the government? It is difficult to distinguish one from the other. We observed some interference by the authorities, in particular the president, with regard to the recognition of autocephaly for Ukrainian Orthodoxy. How much of this intervention is legitimate? The Orthodox Church itself must answer this question. In the text of the Tomos of autocephaly, Patriarch Bartholomew recalls that presidents, as representatives of the Ukrainian state for several decades, asked for autocephaly for Ukrainian Orthodoxy since Ukraine became politically independent. In other words, the current president simply continued this line. And we also saw on January 5 at the Church of St. George in Constantinople, former President Viktor Yushchenko, who also commented on why during his time this event did not take place. Therefore, this influence can be evaluated in various ways. But the answer to the question of how legitimately it has been achieved must come from the Orthodox Church, which has a different paradigm of relations with the state than in the Catholic world. There is undoubtedly a political component. After all, this event really struck a chord with Ukrainian society. The public itself has considered the Unity Council on December 15 as the most important landmark event of the past year. This suggests that its importance is recognized not only by Orthodox, but also by Christians of other denominations. Undoubtedly, at such a popular event, every politician, building up their PR campaign, will seek their own benefits. But I hope that our Orthodox brethren are mature enough not to let themselves be used as political agitators in the upcoming elections. Otherwise, this will discredit the moral authority of the church. What did you talk about with President Poroshenko when he flew in for the pilgrimage to Zarvanytsia on July 15? Did he ask you to support autocephaly? Our communication was public, it was seen by all of Ukraine. I tried to outline the paradigm of our relationship. In accordance with the social doctrine of the Catholic Church, the Church maintains a partnership with the state. We are trying to work constructively for the good of the Ukrainian state and the Ukrainian people. But at the same time, we strive to maintain proper freedom from instrumentalization. And that is why I said that I support autocephaly, because these processes are important for state sovereignty, they are important for our Orthodox brethren, and we evaluate them positively. But, despite the fact that Orthodox churches are in the majority in Ukraine, we hope for equal and fair treatment of the authorities towards all denominations, that is, none of the churches should receive the status of a quasi state church. And that the rights and freedoms of the Greco-Catholic Church, in particular, will be properly honoured. The president gave this public assurance. That is, the communication paradigm was clear and understandable. We are the Church, which has always worked for the formation of the state, cared for its future, and always supported the people’s struggle for national liberation throughout its history. But the UGCC has never been an instrument of political struggle and a cog in the state machine, as it happened, say, with other local churches in other countries. Would the UGCC support one more Maidan? Depending on what kind of Maidan it would be. Not every demonstration, not every protest can be called a Maidan. We have already seen a lot of imitations of the “Maidan.” Of course, people have the right to express their disagreement. However, this type of action must also be subject to certain moral criteria of assessment. If Yulia Tymoshenko wins the presidential election, what will be the position of the Greco-Catholic Church? We will work together with the new president, whoever they may be, because we respect the choice of the Ukrainian people. In addition, the presidency is a certain ministry that must be performed. We’ll see what the circumstances are. But I think that the Ukrainian people today are intelligent enough that they will elect those who defend state sovereignty. In particular, it will support those who clearly and plainly declared the course of development of our society toward the construction of a developed European state. Your Beatitude, could you explain your letter of December 18, in which the UGCC extended the OCU its hand and proposed in the future to create a single Kyivan Patriarchate? Immediately there appeared a lot of controversial comments, mainly in the pro-Russian media, which alleged it as the departure of Greco-Catholics from Catholicism and tan attempt to create another denomination in Ukraine that will emerge beyond the jurisdictional boundaries of both Constantinople and Rome. Thank you for coming first to ask me about this. Here it is necessary to distinguish between two concepts: unity and union. I tried to declare this position during the celebrations on the occasion of the 1030th anniversary of the baptism of Rus’-Ukraine. Union is what happened today in the bosom of Ukrainian Orthodoxy when a new structure with a local status was created. Instead, when it comes to an “extended hand,” we are talking about unity. That is, while remaining ourselves, we can and must cooperate—in the name of the good of the Ukrainian people, in the name of truth, in the name of seeking universal unity with Christians, which we call the ecumenical movement. At the beginning, we are looking for ways to restore unity within the now-divided Kyivan Church, which was once born in the baptismal waters of the Dnipro River. This is entirely within the context of the modern ecumenical movement aimed at the restoration of the unity of the entire Church of Christ, the convergence of Orthodoxy and the Catholic Church. The UGCC is a participant in such a dialogue. By the way, the Moscow Patriarchate has completely left this movement. This happened on October 15 after the breakup of Eucharistic communion with the Church of Constantinople? Yes. At the meeting of the Holy Synod of the Russian Orthodox Church, it was declared that they would not take part in any institution, in any inter-Orthodox event presider over, or co-chaired, by representatives of the Ecumenical Patriarchate. How real is the possibility of uniting Christianity? So, in this sense, today we want to cooperate with the Ukrainian Autocephalous Orthodox Church. We have even agreed with His Beatitude Epiphanius, to work out a certain “road map” in order to see in which parts of our church life, while still different denominations, we could indeed do many different things together. And what does it mean to create a single Kyivan Patriarchate? Each local church in its development tends to a patriarchate. And the Autocephalous Orthodox Church of Ukraine, which is a church of metropolitanate status, will most obviously develop to patriarchal dignity. We see that this universal search for unity is important for Ukraine, for the Ukrainian context. We know that the maternal Kyivan Church, which is the common root of both Ukrainian Orthodoxy and the Greco-Catholic Church, reacted painfully to the division between Rome and Constantinople. For many years, the first hierarchs, the episcopate, the monastics, and the faithful of the Kyivan Church considered it a local conflict, a quarrel between the Latins and the Greeks. But later this division entered within the Church of Kyiv. And this is why today every effort must be made not only to overcome the division within Ukrainian Orthodoxy, but also to seriously theologize, pray, and work in order to restore the original unity of the Church of Kyiv in its Orthodox and Catholic branches. And just as the UGCC carries the mystical ecclesiastical memory of the undivided Christianity of the first millennium. Although today we live in full communion with the successor of the Apostle Peter, we consider our Mother Church to be the Church of ancient Constantinople. What prevents the restoration of Eucharistic unity between Orthodox and Catholic Churches today? You see, when it comes to certain obstacles, they are primarily dogmatic, at the level of a certain ecclesiological doctrine, that is, the doctrine of the Church and its internal organization. But today, there exists a search for ways to unite on the basis of studying the paradigm of relationships between the primacy of the Pope of Rome and Church synodality. It’s like digging a tunnel from two different sides, waiting for the two sides to meet each other. In addition, we see that there is a certain fragmentation in the Orthodox world, and now there are attempts to gather it together. And the Pan-Orthodox Council in Crete in 2016 was just such a renewed instrument. That is, it was felt that for Orthodox Churches to respond to the challenges of our time, they needed some kind of universal authority or universal mechanism of unity. From the Roman side, there is talk today of the development of synodality and what is called healthy decentralization, proclaimed by Pope Francis. And the last meeting of the Joint International Commission for Theological Dialogue Between the Catholic and Orthodox Churches was devoted precisely to this theme: the synodality of the Church and the primacy of the Pope. That is, how to reconcile, on the one hand, the territoriality of each church and, on the other, to accept that the successor of the Apostle Peter—the Pope of Rome—has a certain mission as minister of Christian unity, its core, and the highest church arbiter. Such is the movement towards each other. How often do Pope Francis and Patriarch Bartholomew of Constantinople meet? Quite often. Just in the last year two such meetings took place. Could it happen that the UGCC and the OCU restore Eucharistic communion on their own, at the local level? Today, we do not see such opportunities. Obviously, it is the local search for communion that serves as a catalyst for the search for universal unity. At the same time, subject to the achievement of universal understanding, it will need to be applied at the local level. For example, in the context of the ecumenical dialogue, there was a mutual recognition of the sacraments between the Orthodox and the Catholic Churches. That is, re-baptizing Catholics as Orthodox or vice versa is today a complete anachronism. So, certain results have been achieved on the road to each other, but these are not always perceived at the local level. Therefore, we will work in this direction. Creating the OCU is a wind of hope that we are moving into new circumstances and that new opportunities will be created for dialogue and concrete cooperation for the sake of unity in action. Will the appearance of a stauropegion of the Church of Constantinople in Kyiv promote ecumenical dialogue? The existence of such a stauropegion is positive. The Church of Constantinople will no longer be somewhere beyond the Black Sea, and will become our neighbour. This type of contact can be more vibrant, more lively, and effective. We have many joint projects. I personally met with His All-Holiness Patriarch Bartholomew several times, and we even talked about the possibility of restoring certain theological groups, theological research initiatives, that were active in the diaspora before the collapse of the Soviet Union. I mean the so-called Kyivan Church Study Group, which then existed between our theologians and hierarchs in the USA and Canada from the Ukrainian Orthodox Churches that are now under the omophorion of the Ecumenical Patriarchate. Do you predict the deterioration of relations between the Russian Orthodox Church and the UGCC in view of the widespread statements of Moscow propagandists that it seems as if Ukrainian autocephaly is the work of Greco-Catholics? Our position towards the Russian Orthodox Church has not changed. We are open to communicating with anyone who wants to speak constructively with us, and in truth. My predecessor as the Head of the Church, Cardinal Myroslav-Ivan Lubachivsky, once even offered the Moscow Patriarchate to turn the page on the notorious Lviv pseudo-sobor of 1946, when the Soviet government tried to liquidate the UGCC. However, let me give you an example. Last year, one of our most important cultural and spiritual events was the presentation of the facsimile edition of the Halych Gospel, one of the first tetraevangelia, the oldest manuscript of Kyivan Christianity, preserved to this day. This masterpiece was created in Halych, then in the Kingdom of Galicia-Volyn, in present-day Western Ukraine, in 1144. That is, before the foundation of Moscow. Obviously, such a monument shows who we are, where our roots are. For a time, the manuscript was closed behind seven seals in Moscow. We undertook everything possible in order to make it accessible to the general public, to study and understand this Kyiv-Galician vector of Kyivan Christianity, for this axis itself has formed the identity of the Ukrainian nation. And when we presented this gospel book, I wanted to give a copy of all the churches that, we believe, are successors to the tradition of the Church of Kyiv. I visited Patriarch Filaret, who received me very well, which I gratefully remember today. I visited Metropolitan Macarius, the head of the Ukrainian Autocephalous Orthodox Church (UAOC). And I also wished to give a copy of this gospel book to His Beatitude Onuphrius. By the way, we talked about this personally when we prayed for Ukraine in St. Sophia on Independence Day on August 24. But, unfortunately, I was not received. That is, I could not give him the gift. Therefore, our outstretched hand was left hanging in the air. Nevertheless, we are still open to dialogue with everyone, to speak not about what separates us, but to seek out what unites us. From Constantinople, statements were made that after the formation of the OCU, the Moscow Patriarchate lost its canonicity on the territory of Ukraine. What is your Church’s stance now regarding the bishops of the Russian Church in Ukraine? We, as a Catholic Church, do not feel ourselves to be competent to indicate who is canonical and who is not canonical in the Orthodox world. We hope that the Orthodox brethren will be able to figure it out. We strive to maintain symmetrical relationships with all, and we do not want to break even the little strings of that human communication that exist between us in different directions. That is, according to the words of the Apostle Paul, we will try, as far as possible, to live in peace with all. We also hope that the break of Eucharistic communion between Moscow and Constantinople is temporary, that it will be overcome, and that it will not harm world Orthodoxy. However, some other local Orthodox Churches, other than the Russian Orthodox Church, say that they do not recognize Ukrainian autocephaly. We hope that this is also temporary. His All-Holiness, Patriarch Bartholomew, and His Beatitude Epiphanius also hope this is the case. Because the Church of Christ is called to be the kingdom of unity of the whole human race. And where there is a lack of this unity, where it is violated, there man’s sin appears. It is human sin that causes church divisions and hurts the church body. We care for our Orthodox brethren, regardless of jurisdiction. But what will be your attitude to Metropolitan Onuphrius, who, according to the decisions of the Holy Synod of the Ecumenical Patriarchate, has lost the right to the title of Metropolitan of Kyiv? Let’s see how all these relations develop in the Orthodox world. Why were Vatican comments on the situation with the OCU rather restrained? The Holy See cannot comment on the internal events of the Orthodox world. In my opinion, from the side of the Roman Apostolic See it would be exceeding their competence. I can only assure you that the Holy Father wants the ecumenical movement of the Church to go forward. His desire is to really be able to give everyone a hand and hug everyone. And it is obvious that what causes additional wounds is perceived as painful. Therefore, the Holy See commented on these events very carefully. We hope that the Orthodox will reach a consensus on their own. And then it will be the basis upon which to form the proper attitude of the Catholic Church to the Orthodox situation. Under what conditions is a meeting between His Holiness, Pope Francis, and His Beatitude, Metropolitan Epiphanius, possible? Frankly, I don’t know. But I can confirm that His Holiness, Pope Francis, holds His Holiness, Patriarch Bartholomew, in high esteem. Could Kyiv be a place for ecumenical dialogue, the venue for holding an ecumenical Christian forum with the participation of Pope Francis and Patriarch Bartholomew? If I am not mistaken, the Apostolic Nuncio once said that the Holy Father will come to Ukraine if it serves the unity and consolidation of the Ukrainian people. I think that we ourselves must create the necessary conditions and circumstances for Kyiv to become not only a platform for dialogue, but a powerful centre of world Christianity. Then everyone will come here. Do you often speak with the Holy Father about Ukraine? Or perhaps you prepare reports for him? The Holy Father personally, and through various mechanisms of the diplomatic presence of the Holy See, closely monitors the situation in Ukraine. I meet him very often. The last of our meetings took place in October at the session of the Papal Synod. The Holy Father, Pope Francis, really cares for Ukraine, especially regarding Ukraine as a victim of unjust aggression. In fact, he prayed for Ukraine in a fatherly, Christian way during the Christmas services in Rome. In particular, he mentioned us in his Urbi et orbi Christmas greeting, where he always spoke of “beloved Ukraine,” “long-suffering Ukraine” waiting for peace, which is delayed. Therefore, during each meeting we do not talk about anything else, just about that Church, about the people, that I represent. Do you think Ukraine expects a new war for churches, as it was in the 1990s? I would really not want that. And I see that, apart from the enemies of Ukraine, nobody is interested in this. His Holiness, Patriarch Bartholomew, the President, the Speaker of the Verkhovna Rada, His Beatitude, Metropolitan Epiphanius, they all warned of this. Let’s see how these warnings and appeals will be heard. Everyone understands that religious peace is a great treasure that the churches and religious organizations of Ukraine were able to preserve during all the years of war. This is a question of national security, of the stability of our state. But there were many attempts to steal this religious peace. Do you have nay information about Greco-Catholic parishes that might transfer to the jurisdiction of the OCU? Thus far, we do not see any signs of the conversion of Greco-Catholics to the OCU. And we are not observing any trends. Our people are asking for explanations from their pastor, they are interested in this question. We explain to them how we will build our relationship with the Orthodox brethren. But for someone to change their church identity and leave our Church—this we do not see. We remember very well the martyrs and confessors of our Church during communist times, who gave their lives in order to witness to unity with the successor of the Apostle Peter in our days—the Pope. This unity is an integral part of our identity. After all, the fulness of the Kyivan Christian tradition is absolutely preserved and blossoms in the bosom of our Church. After reading your book, Dialogue Heals Wounds, it seems that Greco-Catholics have more conflicts over property not with the Orthodox, but with the Roman Catholics, in particular, for the churches in Lviv. How is this situation being resolved? We do not have conflicts with the Roman Catholic Church (RCC). There are certain property disputes regarding the restitution of church property, which is de facto historically the property of the RCC, but was later nationalized. And when in the 1990s in Western Ukraine a war between the Greco-Catholics and the Orthodox Church took place, the local authorities handed over former Roman Catholic shrines to the Greco-Catholics, Orthodox, and Protestants, in order to quell these conflicts. Yes. If this or that church was given to the Greco-Catholic community, since there was no Roman Catholic community then, and later such a community appeared, today we have to respect their pastoral needs. So we try to resolve such disputes calmly and constructively. But most of the churches are not the property of episcopal consistories or eparchies. This is the property of the community, which acts as the owner and subject of law. That is why the good will of the faithful is needed here. And if, at the episcopal level, we have a common vision for solving such problems, then there can exist controversy at the community level, because there are still many people who have historical wounds, such as those displaced by the Akcja Wisła (Operation Vistula). Therefore, such disputes would be resolved much more successfully if Polish-Ukrainian relations could improve. What is the delay in the process of beatification by the Catholic Church of Metropolitan Andrey Sheptytsky? According to one version, this is precluded by Polish Roman Catholics. Metropolitan Andrey is a giant of the spirit and of the pen. This is a figure who went beyond his historical era, which was dangerous to all the invaders who encroached on the territory of Ukraine. In particular, for Russian—tsarist and Stalinist—propaganda. Polish historiography is also ambiguous in evaluating him. In order to be proclaimed “Blessed,” the miracle that occurred through the prayers and the particular intercession of Andrey Sheptytsky is now being investigated. Will a scholarly biography of Metropolitan Andrey be published in Ukraine? Historian Liliana Hentosh has already published a fundamental work covering the activities of Metropolitan Andrey Sheptytsky from 1923 to 1939. We do not have a scholarly study of his life to the end of the First World War, in particular the period of his monastic life and his tenure as Bishop of Stanislaviv and Galician Metropolitan in Lviv. This is not an easy task, because Metropolitan Andrey is a figure of global stature. Everyone who begins to study his biography at the scholarly level sees that it is a mass of ​​unique information. I would even say that today Metropolitan Andrey Sheptytsky still remains a ”Great Unknown” among the Ukrainian people. And it is our holy duty to make him known.